There's fishy fun to be had with Microgamings’ Ariana pokie, with some interesting bonus features and a popular aquatic theme which draws a lot of players to this type of game. Ariana is the name given to a beautiful (if slightly creepy-looking) mermaid who is just one of a number of sea dwelling symbols that can bring in wins of up to 30,000. This game has the classic 5 reel layout, with 25 paylines to place stakes on. Unlike many games that let players decide how many of the lines to bet on, Ariana has them playing all 25, which is no bad thing really, as wagering 0.01 on a single line and then waiting forever for a win is going to put people off, so it is always advised to have a stake on all of them anyway. This means that the lowest possible bet per spin is 0.25, while players can set the value of each coin from 0.01 to 0.50 and the number of coins from 1 to 10. Add all this up, and the maximum bet per spin becomes 125.00 which is pretty decent and the biggest win of 200x the stake will result in that 30,000 payout. On to the look of the game, and it's mostly good news, with very high quality graphics, only tainted somewhat by the lower paying symbols being made up of the 9 through A high card symbols. Some people are quite happy with them, as they are familiar and the returns are obviously going to go up with the higher value cards, but others prefer to see all symbols being related to the theme. Personal preference, so Microgaming can't really be criticised for including them in this Poker machine. Other symbols are a bit more in keeping with the undersea theme and include Ariana herself, a leafy seadragon (a weird but wonderful type of seahorse), treasure chest and nice view of a coral reef. These reward players with prizes of 75 to 875 coins depending on which ones land across a payline and how many there are running through that line from the left hand reel. With these picture symbols the main bonus of the game will come into play. If any of them appear on reel 1 they will be stacked on all rows, and should the same symbol be present on any other reel it will also expand, provided that this will result in a winning combination. Ariana appears stacked on all reels for even further winning chances, and in practice, this feature turns up fairly often, while should our fishy female end up covering all spots on the reels, the biggest prize of the game is won. But that's not all there is to this game, as a couple of special symbols can boost the frequency of wins even further, with wild and scatters being the Ariana logo and a starfish respectively. They both work in pretty standard ways, the wild completing winning combinations by substituting for others to complete lines, and the scatter being the key to a free spins game. They also have values of their own, so if just 2 scatters are spun up, a win equal to the total bet amount is awarded, while 5 of them equals a prize of 100x the bet amount, and 5 wilds brings in a prize of 10 coins. Three or more scatter symbols start the round, with 15 free spins awarded. Like many similar rounds in other games, the reels are richer throughout, with reels 2 and 4 also featuring stacked symbols for a greater chance of a winning spin. Also, the wild symbol can expand in the same way as other picture symbols, and if this doesn’t complete some winning lines for you, then it’s not your lucky day at all! An unusual feature is that while the free spins can be re-triggered, it doesn't happen with more scatters turning up but instead when Ariana fills the left side reel. Is Ariana a Prize Catch or Damp Squib? 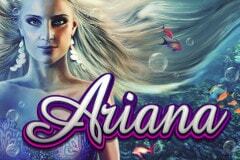 There is much to like about Ariana, from the stylish and pin-sharp graphics, to the innovative bonus features. It’s not perfect however, with a fairly low maximum payout, a wild that’s not worth much on its own and a limited number of picture symbols, but get over these and there is plenty to recommend here.